I bred my albino Rex rabbit 'Jade' on Wednesday the 13th of June 2012. I haven't bred rabbits before, only once before as my wild/rex rabbit gave birth out of the blue to 2 kits but she died 3-4 weeks later when the kits were just starting to eat solid foods and drinking water. About 'Jade,' I don't know what to do. I was wondering what advice you could give me so I can do everything I can to help her during the pregnancy. I have 5 rabbits in total, two 6-7 month old male rabbits (upright ears, don't know their breed), same with two 7-8 week old female rabbits (also same breed as the males but I don't know what they all are!) The only breed I know I have is the Rex. I also have a pregnant guinea pig who is going to pop any day now (very exciting!! ) I let all my rabbits and guinea pigs out but I separate the male rabbits (I put them into a separate pen). You're doing fine, Tallulah, so far so good. Treat Jade absolutely normally for the first 2 weeks after the breeding. It would be helpful if you can palpate her abdomen and see if you can feel the growing kits in her belly. This will confirm a pregnancy. 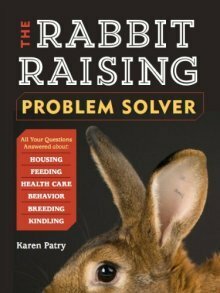 See https://www.raising-rabbits.com/pregnant-rabbit.html for other signs of pregnancy. For the second two weeks, you can start feeding her more food until you're giving her as much as she wants. Day 28 is when Jade will need a nest box, and you can expect the babies on the evening of the 31st day, or, say, first thing in the morning on Sunday, July 15. Once she has her babies, supplement her pellets with a small handful of black oil sunflower seeds or whole oats once a day. This will provide extra oil, which Jade needs for making plenty of milk for the kits.